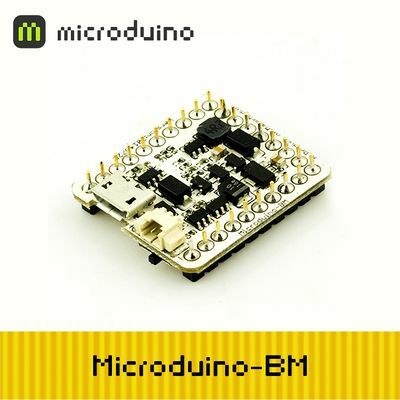 Microduino-BM is a discharging module which combines a single-cell Li-ion battery charge management, power detection and LED indication. 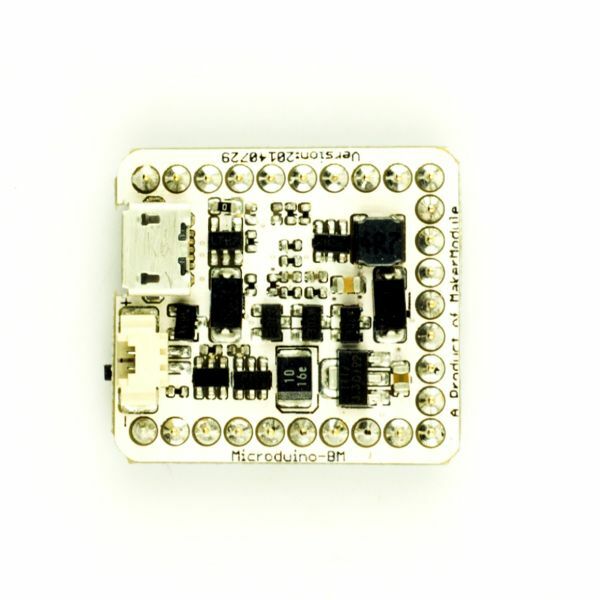 The output voltage is 5V, and LDO is 3.3V output, providing the outstanding battery management for the Microduino-Core module. Integrate lithium battery charge/discharge management, power detection, 5v output, 3.3v LDO. 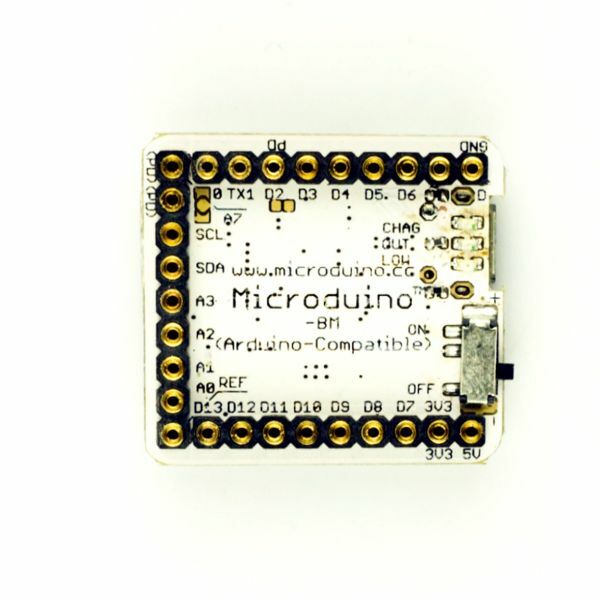 With a uniform Microduino interface standard and rich peripheral modules, it can easily connect with other Microduino modules and sensors. 2.54mm (0.1 inch) pin pitch, compatible with bread boards and pegboards. A MicroUSB interface for power charging. Plug in MicroUSB and charge the lithium battery with the current of 600ma. The indicator goes on when charging and goes out after finishing. When you plug in MicroUSB, the 5v or 3.3v voltage is powered through MicroUSB. Otherwise, the voltage will be supplied by the lithium battery. Meantime, you need to pull the power output switch to “ON”. If it is not started, please plug in MicroUSB to activate and then try again. The indicator goes on when there is electricity output, otherwise, it goes out. 5V offers 1a electricity output and 3.3V offers 700ma output. Low voltage indicator goes on under 3.60V and when the voltage keeps decreasing to 2.40V, the lithium battery protection circuit works. The indicator will go out when the battery is powered to 3.71V. When the output current reaches 1.2A, the lithium battery protection circuit starts and cuts off power supply. The circuit will be activated and get back to work only when you plug in MicroUSB to charge. 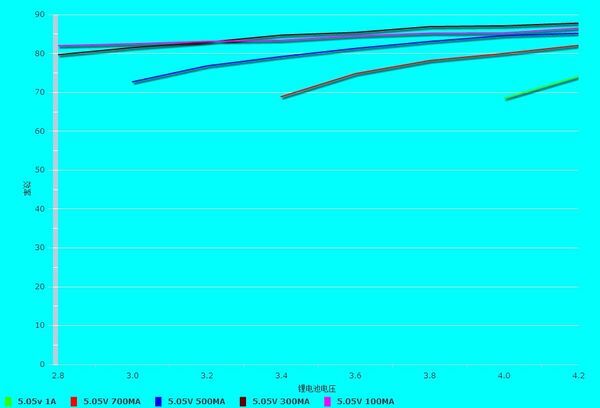 We can see from data above that BM’s 5v output shows excellent transfer efficiency no matter under low or high power output. The load driven capacity of that can reach 1A. The 3.3v transferring efficiency depends on the 1117 chip, which should be around 60% and the load driven capacity can reach up to 600ma. Toggle switch: MSK-12C01 (1P2T) Media:MSK-12C01(1P2T).pdf. Recommended power options: voltage 5V, current 600ma above, such as: computer USB, 5V phone charger. Boost pushbutton can fully control the boost, UPIN27 the GND loop off. March 13, 2013 Batch completed. March 1, 2013 20130202 edition model released, testing is no big problem. February 2, 2013, using mobile power ASIC chip, re-layout. This page was last modified on 17 November 2015, at 08:35.